On the crime scene (confirmed by Monaco’s police – not least by Laurent TOURNIER – and by the Prosecution’s International Office in Stockholm) of “PPP” (Panama Papers Patrica) HUSSON, wealthy Crown Councillor to the Monegasque Crown, the members of the Clubs 137 and 19: Philippe NARMINO, Sweden’s ambassador in Paris (välkommen till Klubb 19!) Veronika WAND-DANIELSSON, Patricia HUSSON (member of both clubs) and Jean-Pierre DRÉNO (free / at large), who was not officially invited – note to IACA / GRECO. It is while Philippe NARMINO was arrested on the 22nd of September 2017 that his childhood friend Prince Albert II chose to publish, in the official Journal de Monaco, his confidence in him, honoring him (övergrepp i rättssak). 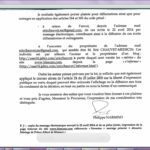 Since his forced retirement, Philippe NARMINO has continued to act as director of judicial services on the Monegasque Red Cross’s (also known as the money laundering factory) web page. Contacted, BIMCAM suggested to its staff that his title be removed immediately as to avoid a criminal complaint. This constitutes, hence, a criminal complaint against Philippe NARMINO (Lex Al Capone). Detail of the illustrated and not censored version of the officialized police reports on Philippe NARMINO. Newspaper La Stampa writes, in its Imperia / San Remo edition of the 26th of September 2017 about perquisitions at Philippe NARMINO’s Red Cross. Has the police recovered this Picture? One has to bear in mind that none of the four top prosecutors preceeding the current one, Jacques DORÉMIEUX, has denied the content of the police reports on Philippe NARMINO (see topic 9), and not even Philippe NARMINO himself, whom BIMCAM herewith thanks for his translation of them into Swedish, with his own official stamp, confirmed by Jean-Pierre DRÉNO’s signature (note to Wikipédia, France, for a free picture). 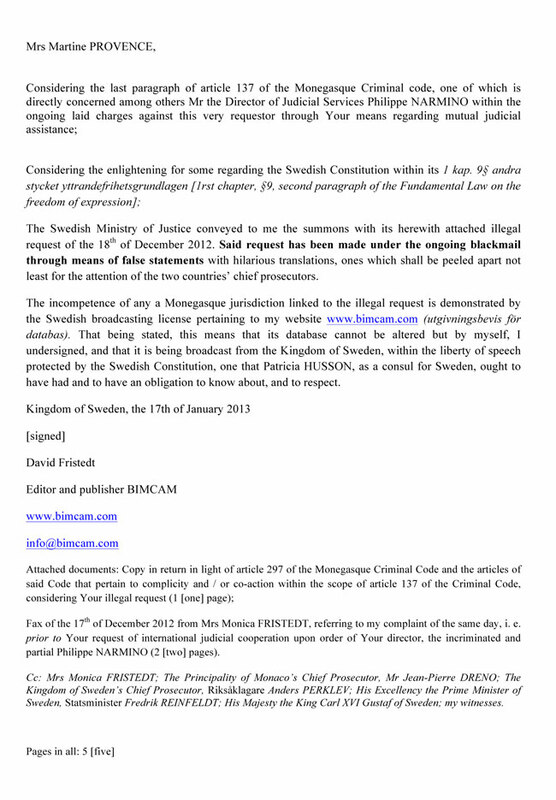 The criminal allegations against Philippe NARMINO (domestic and international co-actors and accomplices included) suggesting life in jail, and considering top prosecutor Jacques DORÉMIEUX’s recent letter in favor of BIMCAM – not published, for tactical reasons -, the latter (BIMCAM) herewith launches the Swedish case in the matters (see topic 8 bis). One of Philippe NARMINO’s co-actors and acomplices is the first president of the appeal’s Court, Mrs Brigitte GRINDA-GAMBARINI (member of Club 137). On the next 28th of September 2017, her Court [-ship?] is to decide upon a case which implicates her inseparable Philippe NARMINO. It is herewith being suggested to any prosecutor to see to that she not be able to take the case, or face nullity of procedure and – evidently – yet another scandal: indeed, she is NARMINO’s biggest asset. Written under Philippe NARMINO’s ever so ongoing threats, however legally recorded for the World to know. The Director of Judicial Services, Mr. Philippe Narmino, is responsible from day one in this scandal. He was president of the court of first instance from which the public disorders emanated, and instead of facing disciplinary measures, was promoted to chief of judicial services, a kind of minister of justice that links solely to the head of State, Prince Albert, who, as we have realized, refers back to the same director of judicial services. Recently, Mr. Philippe Narmino – who is also the head of the Monegasque Red Cross – has become head of a new high council for magistrates (Haut Conseil de la Magistrature). This means that any a judge or prosecutor wanting to act against Mr Narminos’ interests will think twice before doing so. Mr Narmino has, since 2004, climbed up the judicial hierarchy and has now the absolute power over the judicial system in Monaco. Another influential personality in Monaco is the Swedish Consul in Monaco, Madame Patricia Husson who, except for Mr. Narmino, was one of the first official persons to be informed about the burglary / confiscation. In the beginning of August 2004 she was in a letter asked to bring assistance to Mrs. Fristedt whose desperation since the 27 of July grew bigger and bigger. Mrs. Husson never contacted the authorities. Mrs. Fristedt did not get any help to get back her belongings. The Swedish consul is also Conseillère à la Couronne (Counsellor to the Crown / Prince Albert’s Advisor) which means that she has dual loyalty: to Monaco and to Sweden. Moreover, since the 26 April 2010 Mrs. Patricia Husson – who is in the insurances business – has in fact the new right to siege in the aforementioned high council of magistrates where Mr. Narmino is the president. This is interesting if not shocking since Mrs. Husson to Mrs. Fristedt and to the Swedish Ambassador in Paris, the same year declared that she never deals with any civil judicial matters whatsoever. 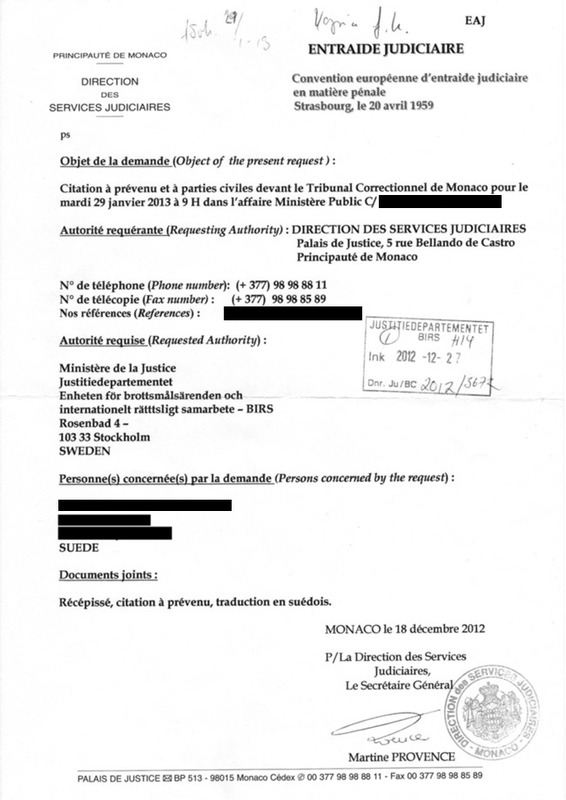 It has to be said that the Monegasque authorities made the scandal international by sending falsified documents to the Swedish Government via the bailiff and Monaco’s former Delegate of Foreign Affairs, late Mr. Rainier Imperti. 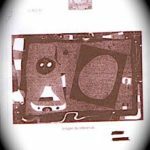 These unbelievable documents, with blackmail on an international scale, have become a case in itself which is called “L’Affaire des agrafes, du stylo marqueur et du bug informatik.” (The staples, marker pen and IT-bug Affair). 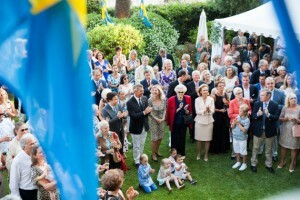 The Swedish Government and the Swedish Head of State have been given the facts and evidence. The Minister of State Mr. Michel Roger, and the Consul Mrs. Husson are well informed and so is Monaco Hebdo, a Monegasque weekly magazine, since Mr. Roger has pronounced that without free press, no democracy. It is important to bear in mind, that Monaco’s Minister of State Michel Roger was one of the judges the 16 February 2009 in the Supreme Court, and that the prosecutor (still working to this date) in the Supreme Court is the same Mr Jacques Raybaud, one of the accused. Your letter of 23 August 2006 elicits a number of questions on my part, but also a number of clarifications concerning the complaints lodged, which in your opinion do not appear to be established. Considering the complete silence demonstrated by the Department of Public Safety and the Chief Prosecutor’s Office regarding this matter, your letter was most welcome. At the same time, however, it came as a surprise to read some of your opinions given the exceptional quality of the information presented to you, particularly that provided by my son, Mr David Fristedt, when you were President of the Court, copies of which were sent to the Chief Prosecutor, Mr Serdet, and subsequently to the Chief Prosecutor, Mrs Brunet-Fuster. In your letter, you write that “violations of the Constitution and abuses of power do not appear to be established”. Articles 21 and 22 of the Constitution of Monaco, which are based on Article 8 of the European Convention on Human Rights, form the solid foundation underpinning our complaints as lodged in particular against a Judge, a bailiff and her lawyer husband, as well as several police agents. I was forcibly evicted from my Monaco apartment and my belongings were made available to others without a court order issued by any Judge to this effect, and without informing the individuals concerned in advance. This is precisely what happened. I do not think I can express myself in any simpler terms; this depicts the horrifying reality of the events, Mr Narmino, and of this there is no escaping. The evidence has been in the possession of the Chief Prosecutor since 2004, evidence which unambiguously constitutes violations of the Constitution. You were the first senior-ranking official in Monaco to be made aware of the facts when I wrote to you on 31 July 2004, scarcely four days after being terrifyingly evicted. If I chose to contact you, at a time when my despair was at its height, it was because a Judge who played a role in the scandal was working for the Court over which you were presiding. I contacted the Court of First Instance, from where the public order disturbances originated. Your response simply informed me that you were unable to do anything. I will probably never forget the response I received. Perhaps the development of the facts would have taken a different route if you had communicated my letter to the Director of Judicial Services at the time, Mr Alain Guillou? Following the example of what the Minister of State at that time, Mr Leclercq, most certainly did? Considering your implication that neither I nor my son were sufficiently clear in terms of describing the abuses of power and the violations of Articles 21 and 22 of the Constitution, I hope to now be able to shed more light on this matter for you. Given the number of individuals presently involved, I will try to be concise. You lead me to believe that you have read my letter of 31 March 2006 addressed to H.S.H Prince Albert, but it is not clear from your letter whether or not you were aware that this correspondence consisted oftwo different letters, the first of which was already delivered “into the hands” of the Prince, by means of his Protection Officer at the time, on 10 October 2005. This same Protection Officer assured me, before taking leave of his duties, that I would receive a reply from the Prince within 90 days at the latest. I feel it is important to emphasize this detail, since, as far as I and others understand it, H.S.H. Prince Albert ensures, in the same manner as His Majesty the King of Sweden, that he indeed receives all correspondence addressed to him in order to be able to read and respond to it personally. It was, moreover, due to the fact that an official response was not received that the case was brought before the Council of Europe. It is for this reason that I was surprised to receive a response from you, almost a year afterwards and not from the Prince’s Palace or from Mr Alain Guillou, based on what the Prince had decided. In the previous instance, you should nonetheless normally, as Mr Guillou’s successor, have been aware of the fact that my letter was received by the Prince back on 10 October 2005, which would suggest that Mr Guillou had not been contacted. It is because my letter contains sensitive information, and so that not the slightest suspicion of lack of impartiality hangs over you or the Chief Prosecutor, that I quite naturally contacted H.S.H. Prince Albert, the only true guarantor of the Constitution of Monaco. It is, in effect, as President of the Court of First Instance that you are held chiefly responsible for the actions of Judge Gambarini, First Vice-President of the Court at the time, and in particular for the bizarre documents claiming to be divorce papers sent by your Registry with threats of seizure and confiscation of my son’s belongings, as well as orders to pay sundry amounts. The Chief Prosecutor, on the other hand, should be held responsible for these counterfeits with their fanciful translations, if they truly came from the Chief Prosecutor’s Office. Indeed, the Chief Prosecutor’s signature is missing, as you are aware, from the documents sent by Mr Imperti. It is for this reason that I was seriously advised to contact H.S.H. Prince Albert directly. Furthermore, the decision to contact H.S.H. Prince Albert directly was also taken after careful consideration in view of the fact that both I and my family realised that it was going to be difficult to obtain assistance from the very authorities that were responsible for the fact that I was physically evicted, with no prior warning, from my apartment, which resulted in it being accessed by an individual who had no right to be there, based on an order that did not carry my name and the active participation of the bailiff, and exclusive access being given to my most private belongings, such as correspondence, confidential documents, online banking access codes and highly valuable works of art, etc. There came a time when I faced a real possibility of ruin. My documents had been searched from top to bottom, precious jewellery had been stolen/confiscated, among other items. All of this was the result of the criminal actions of the bailiff (breaking and entering by means of a locksmith, with no order permitting this). I am speaking of the role played by Maître Escaut-Marquet. Her husband, Maître Didier Escaut, furthermore threatened in writing to have my son’s belongings seized by his wife, the bailiff, if my son did not deposit a not insubstantial sum of money into an account, the number of which we are unaware, within 48 hours. This demand having failed, just as I refused to deposit 300,000 euros to recover my belongings, they contented themselves, based on information then known to the Chief Prosecutor’s Office, to take my jewellery and other belongings, which the Court over which you presided at the time confirmed in writing, in the form of a written statement from one of the individuals involved. And, speaking of evidence, in the form of a statement signed by Maître Escaut-Marquet herself. If the apartment was searched as part of a blackmail attempt, it is useful to note that ultimately my son did not keep any belongings of great monetary value in the apartment targeted, meaning that it was above all my belongings which were stolen. You may consider what I have just clarified above as the reason why I decided to send a copy of this letter to H.S.H. Prince Albert, so as to avoid any possible misunderstanding, from either side. The safety referred to in the abovementioned articles of the Constitution of Monaco appear to me to be a prerequisite for the economy of Monaco, and so that others dare to make it their home or invest here. This is why we cannot believe that the abuses of power demonstrated represent the Prince’s wishes. “Exposing a “network”, Sébastien Biancheri, the Prosecutor, calls for a “suitably harsh” sentence, of two years imprisonment and arrest warrants, as “there is a trust which must remain intact” on the part of investors in the Principality”. Refer also, when reading this article in full, to the advert on page ten (www.bimcam.com ), relating to much more serious facts, pertaining to yourself. With this reasoning in mind, I would be truly grateful if you could let me know if your letter was really written “in the Prince’s name” or if I should consider your letter as a representation of your personal opinion. Indeed, this is not clearly established. The ongoing misdemeanours and crimes that were to be added to this illegal divorce request appear to have come to light due to having been of fundamental importance in protecting those involved in this matter, with the resulting eviction, confiscation of property, blackmail, etc., even reaching such proportions that the Government Adviser for External Relations at the time, Mr Rainier Imperti, was implicated as regards this incredible situation of fake translations and libel concerning me which came, so it would appear, from the Chief Prosecutor’s Office, to be sent to the Swedish Government. The main individuals involved are Maître Escaut Marquet and her husband Maître Escaut, supported by official stamps. When Mr Imperti’s role as messenger turned out to be unsuccessful for this purpose, it was simply changed to that of a Court Registrar. The evidence provided by Mr David Fristedt and sent on 29 April 2005 to the Chief Prosecutor in the form of a 42-page bundle, the incredible staples, marker pen and IT bug affair, would surely have made an impression on you. 1. Complaint lodged by Mr David Fristedt on 2 August 2004 against Maître Escaut-Marquet for having confiscated my belongings and having made them available to others without any order being issued to this effect. These lines practically replicate word for word that which you can read in the Codes and Law of Monaco. Premeditation has been proven not only by the inexistence of any order carrying my name, but also by an invoice coming from the Court over which you were presiding at the time. This was for an amount of some twelve euros, which have never been paid. You should be expected to know this, given that you confirm to have read the file. This complaint must still be pending, considering the fact that Mr David Fristedt has yet to receive anything from the Chief Prosecutor’s Office. A stranger, Mrs Boof, who is the subject of complaints lodged for having taken “all” of my jewellery out of my apartment, was working on the day the events took place for Maître Escaut-Marquet’s clerk, a certain Mrs Métivier, who gave me some crumpled business card, a scrap of paper, carrying the title “huisier” (bailiff), incorrectly spelt in French with one s, as the sole proof that she worked on behalf of Maître Escaut-Marquet. I have therefore come to the conclusion that Maître Escaut-Marquet is responsible for these illegal actions and for the part Mrs Boof played at the scene of the crime. It should be noted that Mrs Boof claims to know how much jewellery I own as a result. The evidence of these crimes exists notably in the shape of written admissions signed by Mrs Boof, and in the shape of a statement signed by Mrs Métivier, the two documents having been furthermore confirmed, supported by a stamp, by the Court over which you presided. For as long as these crimes remain unpunished and for as long as the bailiff and [Mrs Shahzada] continue to hold the photos taken by the aforementioned bailiff , according to the statement, on 27 July 2004 of all my other jewellery, works of art of great value, the damages suffered by me are ongoing. They constitute a real and ongoing threat to me. The blackmail demonstrates that they will not flinch in the face of anything. The evidence, in the form of official documents, has been in the possession of the Chief Prosecutor since 2004. The damage suffered manifests itself in the form of stress that is incompatible with my most recent heart surgery at the Monaco Cardio-Thoracic Centre. 2. The complaint lodged by Mr David Fristedt on 7 August 2004 against the First Vice-President of the Court, Mrs Brigitte Gambarini, for having signed an order giving the right to an individual to live alone in the apartment where the individual was neither in possession of a lease nor an accommodation agreement (proof confirmed on two instances in writing by the Department of Public Safety), nor a currently valid ‘carte de séjour’ (temporary residence permit). Observation. – Considering your letter, “In Monaco, therefore, one can say to a Judge that such and such an apartment is my marital home, without a residency permit, without an accommodation agreement, and without being the tenant, in the absence of any checks, with an individual or a family being forcibly evicted in their slippers, and that one can have access, also in the absence of any order, to the victim’s cheque books, online banking access codes and jewellery, etc. And apparently, photos of all the contents of the victim’s apartment. 3. Complaint lodged against an unnamed party of 7 August 2004. Observation. – “Unnamed party” can be read in the plural. I did not want to establish who the individuals are. It may be the case that one or several individuals, or all the individuals involved until present are implicated, in one way or another. This was done insofar as it was not my intention to have myself take the place of public action in a case that is in legal terms so simple and flagrant. Considering that Mrs Gambarini never issued an order carrying my name, it logically and inexorably results in perfect proof confirming my status as a victim. This is particularly exacerbating for Mrs Gambarini, on the other hand, in that she secretly undertook her actions without informing the tenant. And that all of this was done without the knowledge of the individual concerned, Mr David Fristedt. The fact that the Monaco authorities confiscated my belongings and that they made these available to others for a period of three months is incontestable. Evidence of these violations of the Constitution appears in writing in your Court Registry. You may use other words to describe it, but the truth of the matter remains the same. The unannounced confiscation of the home of another, containing their personal belongings inside and to the detriment of the integrity of individuals who are innocent and where a court order has no bearing on them, constitutes crimes of the State of the vilest kind, and is something that is, quite simply, unacceptable in a democracy. the divorce trial attempt, the order which did not carry my name, the burglary by breaking and entering, the blackmail, the threats to confiscate personal property, the public libel towards me by way of the Government Adviser for External Relations for the attention of the Swedish Government, and finally, the theft of my belongings, unless this amounts to the confiscation that Maître Escaut describes in writing, but which, instead of concerning my son, resulted above all in my jewellery and other belongings being removed. At this point in the letter, you must undoubtedly be convinced, in view, notably and furthermore of the final divorce decision in Sweden, despite your letter which wrongly stated that the divorce was not final, although this was confirmed by the Monaco Town Hall, that the eviction, blackmail, confiscation and theft were premeditated situations and that everything turned out to be a hapless attempt at obtaining money, an economic footing, or other benefits through criminal means. 4. Complaint lodged by Mr David Fristedt on 13 October 2004 against Maître Didier Escaut for blackmail and attempted blackmail (besides other attempts) according to Article 323 of the Criminal Code, in its first paragraph, for trying to obtain 300,000 euros in exchange for me being able to take possession of what is rightfully mine. Evidence submitted to the Chief Prosecutor’s Office and uncontested by the individual involved, Maître Escaut. Observation. – A lawyer who uses such methods, besides the collusion of his wife, a bailiff, must be removed from his profession, and separated from society, to the extent that he does not have the right to assist his clients in criminal acts; even less to take charge of these acts himself. The fact that the lawyer made use of Mafia-style methods to satisfy his client’s wishes seems to prove that his client is not the only real agent, other than that the individuals who believed the stories and slander of the aforementioned lawyer’s client saw themselves obliged to take an active role in the acts, by way of the power of corruption or “influence”, in order to protect themselves. It follows that this same individual remains vulnerable to blackmail by the client of the lawyer in question, hence the situation with no way out, except to face the facts, with which the Principality of Monaco is now confronted, and to repair the damages. It, however, goes without saying that the disturbances in question are not those caused by [Mrs Shahzada]. She has obviously never had the power to harm me by acting alone. The responsible party is the State, due to crimes and misdemeanours committed by its officials, not to mention the individuals with whom some State officials have chosen to form an alliance. Equally, it goes without saying that I would never have directly contacted H.S.H. Prince Albert for a simple matter regarding a divorce. I truly would have thought you capable of understanding this fact. I would like to add for your benefit, Mr Narmino, the fact that there is nothing exceptional about a woman wanting to acquire her husband’s assets; it is an everyday occurrence throughout the world. What is less commonplace, however, is someone succeeding in taking possession of the home and belongings of [me], who is a widow, with the assistance of a Judge and a bailiff, despite the lack of the aforementioned [my name]on an order of any sort, and that this same individual can, thanks to this, engage in blackmail with the active cooperation of the authorities on an international scale. It should be in the interest of the State of Monaco to clearly demonstrate that these sorts of swindlers have no place in Monaco. Particularly as their actions send out extremely welcoming signals to other dubious individuals of this sort, who believe, and with reason in light of your letter, that acquiring the property and money of others can be achieved in Monaco without problem, and with impunity. Besides the violations of the Constitution in question, it also seems appropriate to me to highlight the violence with which the authorities flouted my most fundamental rights. I was jostled out of my apartment, in my slippers, without my medication, without anything, without my mobile phone charger, after a non-reported “decision” to break down the door unless I opened it. This took place in full view of the concierge and other employees; and finally in full view of the police, whom I had called. At no point was my personal condition taken into consideration. There was only room for harsh cruelty.This manner of proceeding undoubtedly took place in Europe from the end of the 1930s, but it obviously does not reflect the way things should proceed in free and democratic countries. Now, these violations have taken place, with supporting evidence, in Monaco, a country in which Prince Albert acts as guarantor so that such actions on the part of the authorities may not happen. If those responsible for the current matter persist in saying or suggesting that they are acting in the name of the Prince, this cannot be true: it is completely implausible and must therefore come down to lese-majesty. In clear terms, the damages suffered by me and mine should be compensated, and the image of Monaco as a safe location restored at the same time. There is no doubt that this image is rapidly being tainted. Once again coming back to your letter, you write that I can turn now towards “competent courts” to assert my possible rights. Do you wish to suggest that there is another court, higher than those I have had recourse to up till now? Despite the correspondence to the Prince? Despite the Chief Prosecutor’s last initiative? Despite the matters currently pending? Or do you wish to suggest, rather, that the competent courts are to be found outside of Monaco? Despite the matters currently pending? This final question is crucial, as we have been trying in vain to understand the meaning behind the words you have expressed. I would, therefore, be grateful if you could clarify this point, given the consequences, at the stage we are at, of any error or misunderstanding. Given the extent of the ongoing damages that I and my family are suffering on a continual and ever-increasing basis, of which the Chief Prosecutor’s Office has been aware since 2004, it is high time the State accepts its responsibilities in order to find a solution with regard to the compensation due, so that I can get on with living my life and that the matter is brought to a close. It has already been determined; the State of Monaco now finds itself faced with a “fait accompli”. 153. The remedy demanded by article 13 of the [European] Convention [of the Human Rights] must be “effective” in practice as well as in law, particularly in this sense, as its exercising must not be prevented unjustifiably by acts or omissions by the authorities of the defendant State (judgment Paul and Audrey Edwards v. United Kingdom, no. 46477/99, ECHR 2002, § 96). 154. It is also in these latter obligations that the Principality of Monaco has defaulted in this case, despite the many referrals made by Mrs. Fristedt and by her son before the Monegasque authorities. 155. If such instances, as these had been considered with due seriousness by the Director of Judicial Services, Mr. Philippe Narmino, by three successive Chief Prosecutors – Mr. Daniel Serdet, Mrs. Annie Brunet-Fuster and Mr. Jacques Raybaud – and by the Director of the Police Department, Mr. André Mühlberger, fresh disturbances to public order could indeed have been avoided. The lack of impartiality by the Director of Judicial Services, Mr. Philippe Narmino. 177. 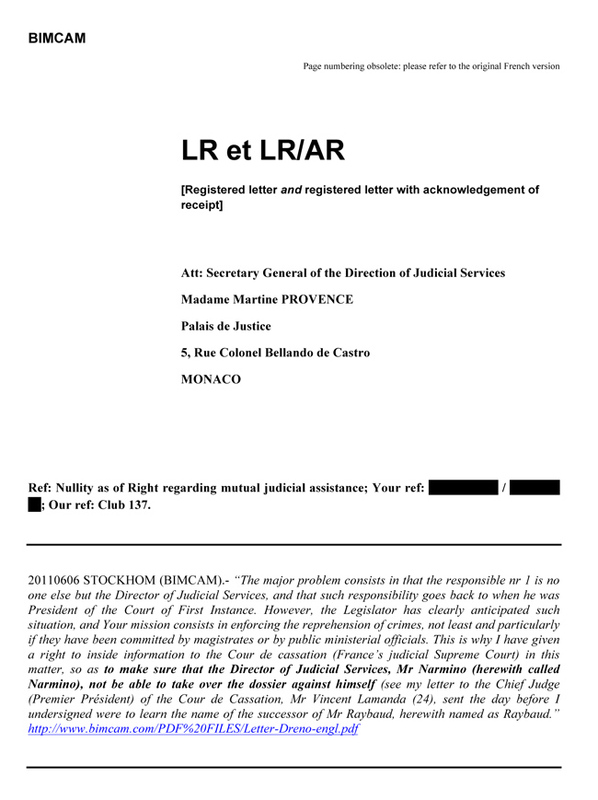 Although the personal impartiality of a magistrate is presumed until proved otherwise, Mrs. Fristedt had already expressed serious reservations before the Supreme Court of Monaco concerning the impartiality of the Director of Judicial Services, Mr. Philippe Narmino, in examining complaints lodged by the plaintiff. 178. The facts are that some of Mrs. Fristedt’s grievances covering the breaches of her fundamental rights concern Mr. Philippe Narmino personally, both as a former President of the Court of First Instance at the time of the facts, and in the performance of his duties as Director of Judicial Services (in this respect, see the judgment by the European Court of Human Rights in the case of Procola v. Luxembourg, judgment of 31 August 1995, series A no. 326, p. 14). 179. 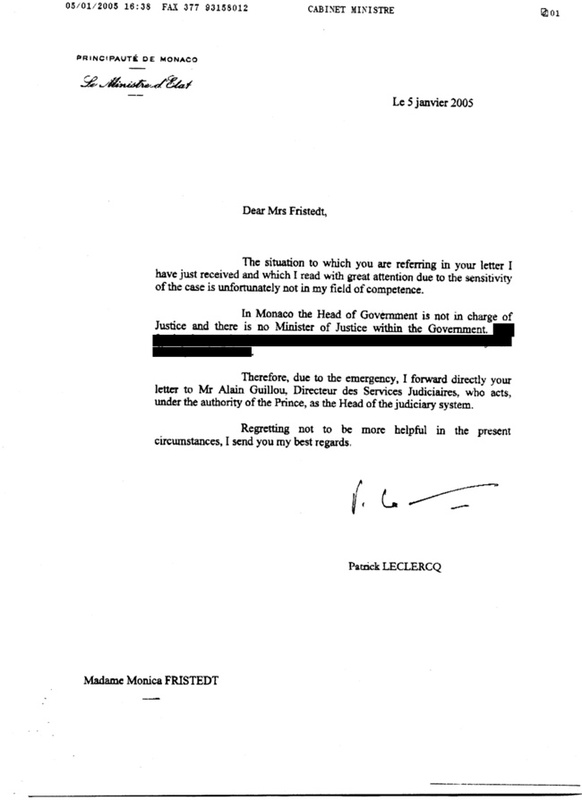 Accordingly, as early as 31 July 2004, [four days after the confiscation] Mrs. Fristedt personally petitioned the President of the Court of First Instance, at the time Mr. Philippe Narmino, asking him for a copy of the ruling barring her from access to the apartment of which she was the tenant, as well as for any ruling preventing the latter from recovering her property in her home. Mrs. Fristedt had specifically drawn the attention of the President of the Court of First Instance, Mr. Philippe Narmino, to the fact that her works of art, her confidential and sensitive files as well as the jewels belonging to her had been in her home, which had been made available to Mrs. Shahzada by the Monégasque courts. 180. Nevertheless, in a letter issued by the Court of First Instance of the Principality of Monaco, dated 4 August 2004, the President of the Court of First Instance informed Mrs. Fristedt that he was not authorized to answer her letter of 31 July 2004. 181. Subsequently, Mr. Philippe Narmino, in his capacity as Director of Judicial Services, in a letter dated 23 August 2006 sent to Mrs. Fristedt, suggested that “the breaches of the Constitution and abuse of powers that you allege do not appear to be substantiated by the facts”. 182. In order to avoid a contentious outcome to the case, Mrs. Fristedt sent once more a fresh letter to the Director of Judicial Services, Mr. Philippe Narmino, dated 20 June 2007. 183. 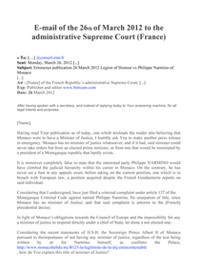 However, the Director of Judicial Services, Mr. Philippe Narmino, in a letter of 24 July 2007, stated that he was not duly empowered to commit the Monégasque State in this case and that, as [the officer] responsible for the administration of justice, he was not in any event disposed to respond favourably to said request. 184. The Director of Judicial Services cited the supposed delay by Mrs. Fristedt “in exercising the various remedies in due and proper time” against the breaches of her fundamental freedoms of which she has been the victim, and appeared in any event to deny their continued or continuous nature. 185. Finally, the Director of Judicial Services also asserted that the concept of “continuous breach” was used essentially only for property rights guaranteed by Protocol no. 1, which has not been ratified by the Principality of Monaco”. a) Whether, based on article 20 of the Order of 9 March 1918, the Director of Judicial Services had instructed the Public Prosecutor and his deputies in order that criminal proceedings might be instigated in this case? b) Whether, on the contrary, the Director of Judicial Services had given instructions to drop the case or any other instructions? c) Whether the Director of Judicial Services, as the line manager and disciplinary authority, had taken disciplinary action against the judges, the administrative officials and the court officers who reported to him, who were responsible for the serious breaches, which were substantiated by the facts, of Mrs. Fristedt’s fundamental rights? 186. It is an established fact that, in the Principality of Monaco, the Director of Judicial Services supervises the due administration of justice, for which he is responsible to the Prince alone. In this regard and in accordance with the principle of the separation of powers as it applies to Monaco, the Director of Judicial Services does not sit in the Council of Government. Likewise, pursuant to article 46 of the Constitution of 17 December 1962, as amended, sovereign orders concerning the judicial services are not debated in the Council of Government, but are taken by the Prince on the recommendation of the Director of Judicial Services. Moreover, the, Director of Judicial Services submits to the Prince recommendations and proposals for the nomination (and/or tenure) by sovereign order of all magistrates, defence lawyers, notaries and process servers, as well as the officials assigned to the management of the Direction of judicial services. 187. The Director of Judicial Services is also a line and disciplinary manager for the administrative officials who report to him. In disciplinary matters, he can in particular issue a warning or a reprimand to an official or convene, by official order, the Disciplinary Council in order to issue a more severe punishment by sovereign order (demotion, retirement from office, dismissal). As a precautionary measure, he may also suspend an erring official temporarily from his office, with or without pay. 188. Regarding the matter of magistrates, the Director of Judicial Services may in particular, pursuant to the aforementioned Order of 9 mars 1918 (article 10), remind the formers of the rules or reprimand them both for their public and for their private actions. Finally, in accordance with the provisions of article 139, paragraph 2, of the Code de procédure civile [the Code for Civil Proceedings], the Director of Judicial Services represents the State before the courts if the sovereign authority is questioned due to the functioning of justice. 189. The powers, properly judicial, of the Director of Judicial Services have essentially dealt with criminal cases. Thus, article 20 of the Order of 9 March 1918 stipulates that he shall direct the public case – viz. criminal proceedings against the presumed perpetrators of any kind – without exercising it directly and without any power to stop it or suspend its course. As such, the Director of Judicial Services is authorised to give instructions to officers of the public ministry, principally the Public Prosecutor and his deputies, united under the aegis of the former. The Public Prosecutor is more particularly responsible for these proceedings. Moreover, the opinion of the Director of Judicial Services may be solicited by the Prince on any question concerning justice. 190. This is why Mrs. Fristedt in her letters of 22 September 2005, 31 March 2006 and 5 March 2007, and through letters from her counsel dated 17 August 2007 and 12 June 2009, respectfully petitioned His Serene Highness Prince Albert II to intervene in the case in order that it might be resolved impartially. 191. His Excellency Mr. Georges Lisimachio, Head of Cabinet to His Serene Highness Prince Albert II, in a letter dated 25 October 2007, wrote that it was impossible for His Serene Highness, regarding court rulings and their enforcement, to intervene in any way whatsoever, as the principle is that judges should be independent. However, a copy of this letter, to be used as appropriate, was sent by His Excellency Mr. Georges Lisimachio to the Judicial Services Department. 120. 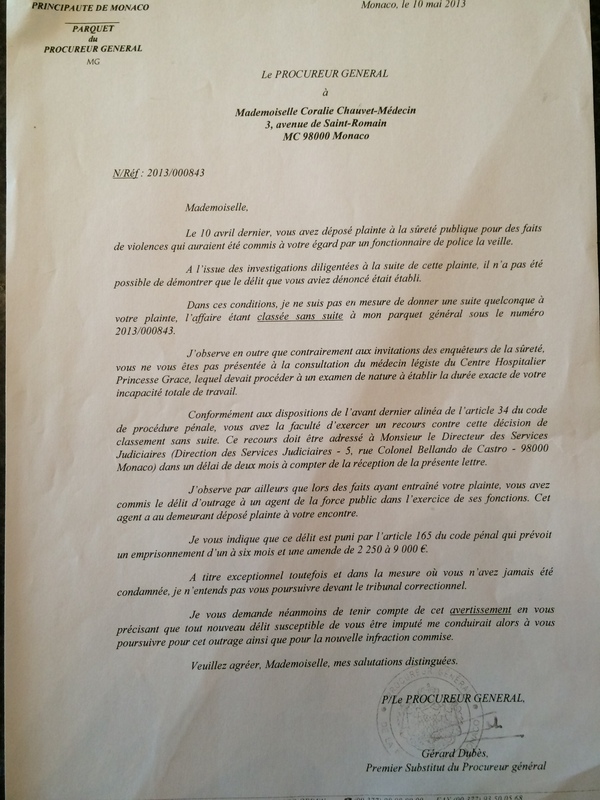 To this day, the Director of Judicial Services [Mr Philippe Narmino], the Director of the Police Department [Mr André Muhlberger] and the Chief Prosecutor [Mr Jacques Raybaud] have persisted in their refusal to investigate or to make arrangements for due investigation into the complaints presented by Mrs. Fristedt and the members of her family. As to other administrative complaints and appeals which Mrs. Fristedt initiated with His Serene Highness Prince Albert II, these have manifestly been an ineffective remedy for reinstating Mrs. Fristedt’s rights. Likewise, no disciplinary proceedings have been initiated against the co-authors responsible for breaching Mrs. Fristedt’s fundamental rights. As in 2004 during the Staples, marker pen and IT-bug Affair, the Club 137 continues to give orders to the Swedish Government’s office, with new forgeries of public writs and hilarious translations, this time implicating Prince Albert II and the United States of America. All within the ongoing blackmail. The illegal request for mutual judicial assistance (above) was sent back to the sender (see below). The author of the handwriting on top of the page has been identified for all legal intents and purposes. 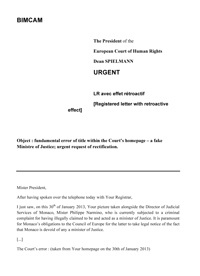 Letter to the president of the European Court of Human Rights, Mister Dean Spielmann (extracts) who has put forward the quality as guest of honour of the Court that of incriminated Philippe Narmino. It is herewith suggested to take notice of the fact that the criminal complaint for usurpation of title was given to the Swedish Police as well as to Sweden’s Administrative Supreme Court, of which – timely – a judge was promoted to this European Court of Human Rights http://www.echr.coe.int/Pages/home.aspx?p=court/judges&c=#n1368718271710_pointer. Mister Spielmann proclaims having good relations with Monaco, basing himself on the figures produced by this State, which doesn’t comply with the most elementary obligations (since soon ten long years) for having a judge within the very Court. However, such figures do not take into account a reign of terror (attached document HFD13 in case # 1226-12 before Sweden’s Administrative Supreme Court) which effectively impeaches any a Monegasque native or resident to seize the Monegasque justice in the first place (first instance), considering the growing number of criminal convictions to firm jail sentences for any he or she be considering criticizing Monaco or Albert II. To appeal is nowadays considered a criticism of the Prince’s Justice (sic). The European Court of Human Rights must have no relations. This is not rocket science. It must remain neutral and impartial. In Monaco, the psychiatric ward is used as a state tool for the advancement of intimidation and threats. Authorities do not hesitate to lock people up. Local lawyers betray their clients by reporting everything to the state in blatant NKVD-style. The police follow their privileged residents and issue general notices of those being mentally deranged the very minute such persons issue a complaint against Princess Grace Hospital Center, or against Monaco’s authorities. Medical records are considered state property. The state will not flinch in the face of breaking and entering residents’ homes and rifling files in search of something of interest, including medical history. At anytime, one can be locked up and drugged. For persons without family, this may very well be indefinitely and go unnoticed. It is believed Monegasque authorities put pressure on foreign doctors, too, for the purpose of obtaining information. These proceedings are an efficient tool against people who question Philippe NARMINO, Monaco’s Chief of Judicial Services, who is said to benefit from this system. Through a team of loyal bailiffs, NARMINO has created reign of terror […]. HFD13 (Attached document nr 13 of the writ to the administrative Supreme Court of the Kingdom of Sweden [Högsta Förvaltningsdomstolen]. This is being published due to the explicit demand by Monaco’s highest ranked prosecutor Jean- Pierre Dréno to have the police reports on Narmino translated into Swedish for the attention of the Swedish Government (adequate causalty with the present publication). This document, the uncensored version of the police reports, has since been launched into the public domain, after a definitive decision of Stockholm’s international prosecution’s office. Re: Usurpation of professional title; Philippe NARMINO, Monaco: a fake minister of justice within the IACA; international reiteration with criminal intent of corrupting the IACA; urgent demand that Austria prosecutes the intruder; police reports on Philippe NARMINO regarding corruption at the highest international level; www.bimcam.com . 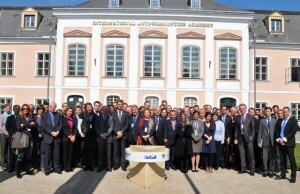 It is by the present letter of information asked to the board of the IACA to forward the present to all parties concerned with the IACA:s tacit motto, i.e. against corruption, not for corruption. I ask the board to forward a copy of this letter to the Minister of Justice of Austria, Wolfgang Brandstetter as well as to the Austrian Federal Ministry for European and International Affairs. On the 7th of December 2011, Philippe NARMINO – who faces life in jail – was the subject of a criminal complaint not least for criminally having acted as a minister of justice of Monaco. This case is ongoing. The President of the European Court of Human Rights, Dean SPIELMANN, was given a chance, in early 2013, to read alarming Monegasque and international police reports on Philippe NARMINO. Monaco’s own Police thus considers this individual as being head of any Maffia. All this is being explained on www.bimcam.com . Mr SPIELMANN seems to have learnt how not to use the term “Minister of Justice” regarding said ever so wanted individual, Philippe NARMINO. Nevertheless, in an informal kind of speech in Monaco, the power of corruption by Philippe NARMNO of the European Court of European Rights is to be viewed as a World exclusive piece of information under BIMCAM’s latest update of the 30th of April 2014, under topic 15. In fact, SPIELMANN’s own words constitute the very definition of corruption of the highest institution of hope regarding the IACA’s mission. Can the IACA spot the intruder / usurpator? Will the IACA ask the competent Prosecution’s Office (presumably near Laxenburg, Austria) regarding the usurpation of title of the within the IACA reiterating “black sheep” Philippe NARMINO? Find the intruder / usurpator…. Is the IACA interested of an illustrated / audio version of the Police reports on Philippe NARMINO? Front row of an interesting photo per se: Monaco’s Prosecutor general (or a twin of his) Jean-Pierre DRÉNO, or DRENO, who has all the information regarding criminal complaints against Philippe NARMINO in terms of not least corruption. How much money did the IACA get from MONACO and how? (see police reports on Narmino, topic 9, BIMCAM) This is particularly important in the wake of Barack OBAMA’s order to freeze assets. What are the true origins of the money collected by the IACA? Please answer these questions in time for the oncoming elections within the European Parliament, and not least before Monaco’s hosting of INTERPOL, and its 2015 year dedicated to the celebration of Russia, 365 days in a row. By all means, the present letter’s content shall be followed up, not least considering the States that are not members of the IACA, including – strangely (?) – those on top of the list on Transparency International, i.e. transparent States. The photos within the present come from the IACA’s website and serve as evidence, which in turn goes for the eventual oncoming and warranted attention of the Hague Tribunal (herewith explicitly vaguely referred to) with – dare one hope – the IACA’s official blessing. The two-day tripartite conference on “Strengthening the Capacity of Parliamentarians, Judges and Prosecutors to Prevent Corruption in their Own Ranks: Emerging Trends from Two Years of GRECO Round IV Evaluations” opened at IACA yesterday. 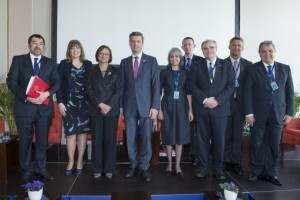 Seventy representatives of GRECO member states have come together to take stock of national experiences and main findings in light of the Fourth Evaluation Round, review policies, exchange information and good practices, and identify future steps for strengthening institutional capacities. Under the auspices of the Austrian Chairmanship of the Committee of Ministers of the Council of Europe, this conference is jointly organized by the Austrian Federal Ministry of Justice, GRECO, and IACA, with extra financial support from the Principality of Monaco. 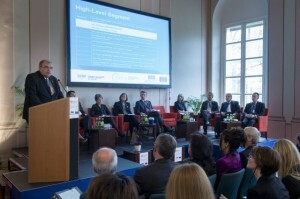 A high-level segment was first on the agenda on Thursday morning, attended by Wolfgang Brandstetter (Minister of Justice of Austria), Gabriella Battaini-Dragoni (Deputy Secretary General of the Council of Europe), Bledar Çuçi (Minister of State for Local Government and National Anti-Corruption Coordinator of Albania), Barbara Prammer (President of the Austrian Parliament), Margarita Popova (Vice President of Bulgaria), Sandra Atuković Kunšt (Deputy Minister of Justice of Croatia), Angelo Farrugia (Speaker of the House of Representatives, Parliament of Malta), Philippe Narmino (Minister of Justice and President of the State Council of Monaco), and Marin Mrčela (President of GRECO and Justice of the Supreme Court of Croatia). Martin Kreutner, Dean of IACA, opened the segment as the moderator. “Let us commend and pay tribute to GRECO for dedicating the fourth round of evaluations to assessing and scrutinizing these important institutions“, he stated. Mr. Kreutner brought up the issue of recurring debates in some European countries on questioning the separation of power and extending and enlarging immunities from criminal and administrative liability for privileged groups of society, including the political sphere. “Such developments are diametrically opposing European values; they deeply disrespect the concepts of equality and equity, of justice and fairness; and they are not compliant with the ratio, the rationale of major regional and international anti-corruption frameworks”, he asserted. Gabriella Battaini-Dragoni shared the staggering figures of the latest Eurobarometer survey which found that 76 percent of Europeans see corruption as widespread, while more than half believe that it has increased in their own country. “I am reminded that someone once said that corruption is like a ball of snow. Once it starts rolling it becomes bigger and bigger until at some point it becomes unstoppable”, she quoted. “But I disagree. Yes, corruption is likely to have increased in many European countries, but we should also remember that the means available to society for detecting it have also been bolstered. That is why, looking ahead, I am cautiously optimistic”. The Austrian Minister of Justice, Wolfgang Brandstetter, praised the monitoring and impact assessment conducted by GRECO as a way forward for improving institutional integrity and increasing public trust. “I consider states’ voluntary and reciprocal review of one another in the fight against corruption not only as an important signal, but also as an engine for the development of standards in the laws. And that helps us to anchor these standards in the minds of the people,” he stated. A thematic session on politics and parliament followed the high-level segment on Thursday afternoon, where GRECO delegates worked together with experts from different sectors to highlight achievements in the area. 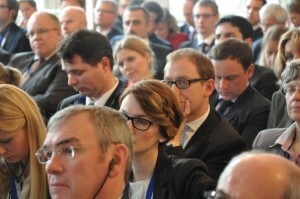 The second thematic session, on prosecutors and judges, opened this morning. The article above shall be commented under the KLUBB 19. Gérard DUBÈS, another member of the Club 137, and active within Philippe NARMINO’s reign of terror. Jean-Pierre DRÉNO was finally fired. 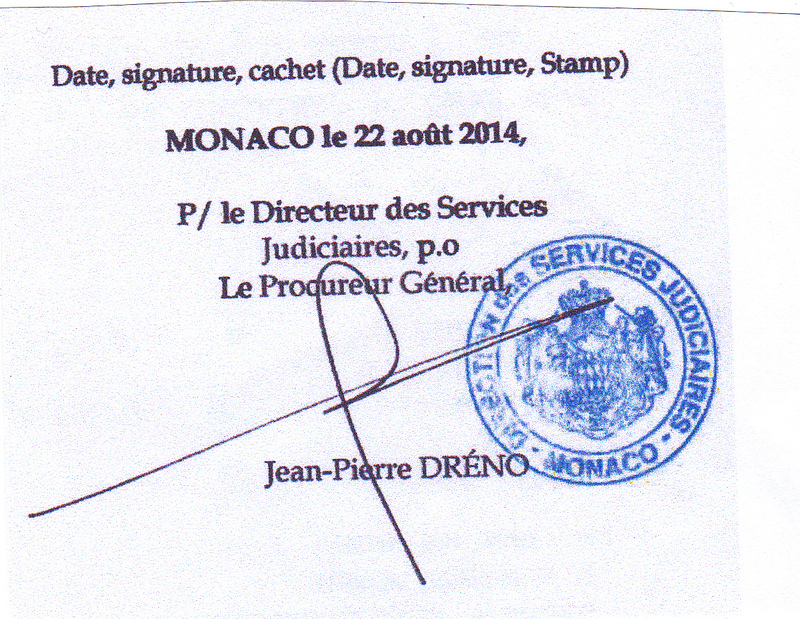 His signature, above, proves the inexistence of any a separation of powers in Monaco. Goodbye and welcome as a practising, non-sedentary member of the Club 137, Mister DRÉNO!